Mac OS X only: Screen locker utility LockTight adds a shortcut key combination for OS X users to quickly lock your workstation from the keyboard. Windows users switching to using a Mac might be surprised to find no equivalent to the Winkey+L shortcut combination that locks the screen, especially helpful in work environments or at home to keep little fingers from opening things they shouldn't. 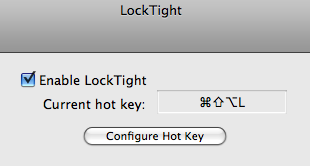 LockTight plugs into OS X as a simple system preference pane with a configurable hotkey, but for full effect you might want to configure your Mac to require a password when coming back from the screensaver and disable automatic login. Hit the link for the download, or take a look at the Switching to Mac guide for all the steps.